There are a number of factors that go into your decision of choosing an orthodontist to create that beautiful smile you have always wanted. Use this checklist to help you find the best orthodontist for you. Does the orthodontic office you choose have a friendly, warm, welcoming and knowledgeable team? You will be spending a fair amount of time in the office at your various appointments. Do you feel comfortable there? Do you feel confident that they can and will answer your questions and take care of any concerns you may have? The answer should be a resounding yes! 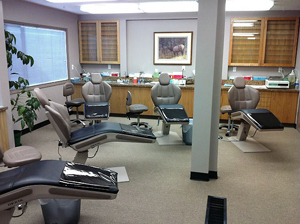 Does the orthodontic office you have chosen have a modern facility? A clean and modern facility reflects on the type and quality of care you will receive. It also represents how advanced the orthodontist will be in your treatment. Does the orthodontic office have flexible financing options? Orthodontic treatment, due to its length of time of treatment, represents a considerable investment on your part as compared to other dental procedures such as simple fillings and restorations. Will the orthodontic practice you choose be willing to offer you flexible payment plans so that you can make the treatment you want a reality? Will they pre-authorize with your dental insurance to determine what will be covered and offer payment plans for any remaining balances? Dr. Keith Corbett's office will always do this for you. Is the orthodontist someone you feel comfortable with? Is the dentist that is doing your orthodontic treatment a Board Certified Orthodontist? Does the orthodontist you choose use the most advanced techniques, braces and diagnostic tools available? Is your orthodontist capable of utilizing different treatment options and types of braces from clear braces, lingual braces, ceramic braces or conventional metal braces? Do you feel comfortable discussing your case and asking questions with the orthodontist you choose? Does the orthodontist encourage your questions and answer them without hesitation and in a way you can understand? Does the orthodontist you choose have a good reputation? Read the online Google reviews on their website, and ask your family and friends, or other dental professionals. Is your orthodontist directly involved in your care at every visit or does he or she delegate this to their staff? Dr. Corbett will see you at each and every one of your visits to assess your treatment progress and answer any questions you may have. He will even encourage your family members to be present at your appointments and be involved in your treatment. The answer to all of the above questions should be a resounding YES! They are vital to your selection of the correct office for your care as it will be with Dr. Keith Corbett, a Board Certified Orthodontist.